Torrential downpours are awesome when you’re inside a building and looking outside through a window. They are less awesome when you’re inside a tent and looking outside through a sopping wet flap. During the night, we had approximately three such downpours. Not to worry, our trusty Marmot Limelight did a fine job and only a little bit of water got in at our feet because it was in a 3-inch deep pool. At a mere 6 pounds, it’s been a great asset on our trip. Minus the hot, humid and horrible incident near Cairns, of course. 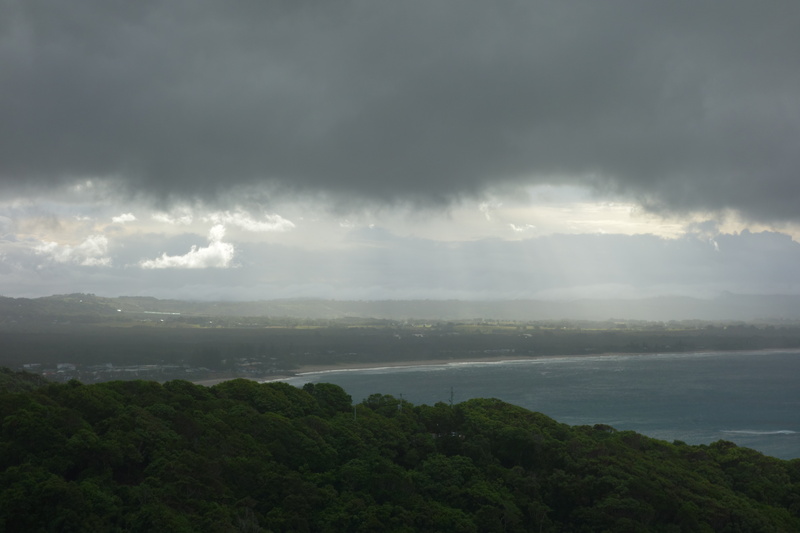 Halfway between our campsite and Brisbane sits Byron Bay, a chilled out surfer’s paradise. We got some serious vegan grub at Elixa and tried an intriguing non-beer brew made from Mexican herbs. Highly recommend both the restaurant and the alternative beer. Weird and worth it. After conducting the requisite drive up to the lighthouse, we headed out of town and–five long, uneventful hours later–arrived in Brisbane. When I booked the hostel for the night, I chose it because it was the cheapest option. It was also, apparently, the best option. Backpackers Brisbane is both quirky and cool at the same time. With an Irish bar offering karaoke and stunning city view, it was an unexpected gem. Considering it was our one shot at Brisbane, we decided to go out to a delightful little underground pub closer to the city center. On that particular evening, they happened to have a live ten-piece band and a crew of enthusiastic swing dancers. I swear they knew I was coming and prepared three piece by Jelly Roll Morton in my honor. With Brooklyn Lager on tap, I was in an Australian’s dream of NYC.